Although I prefer playing Go these days, I still enjoy working through a good chess problem. The following is a rather nice one; regrettably, I don’t remember where I found it. White to move and mate in two. 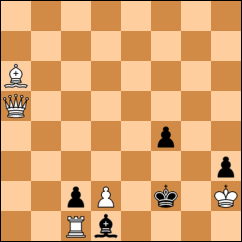 If you’re stuck, highlight the following for a small hint: A mate in two is no longer possible if Black can pass. This entry was posted in Puzzles by cbright. Bookmark the permalink.